The near term forecast is getting even more strongly positive, while the longer term forecast gets a positive jolt. Manufacturing jobs rose by +24,000 for an average of +14,000 a month vs. the last seven years of Obama's presidency in which an average of 10,300 manufacturing jobs were added each month. August was revised upward by +39,000. September was also revised upward by +51,000, for a net change of +90,000. the average manufacturing workweek rose +0.2 hours from 40.8 hours to 41.0. This is one of the 10 components of the LEI. construction jobs increased by +11,000. YoY construction jobs are up +187,000. temporary jobs increased by +18,300. the number of people unemployed for 5 weeks or less decreased by -97,000 from 2,226,000 to 2,129,000. The post-recession low was set al,ost two years ago at 2,095,000. Overtime rose +0.2 hours to 3.5 hours. Professional and business employment (generally higher- paying jobs) increased by +50,000 and is up +546,000 YoY. 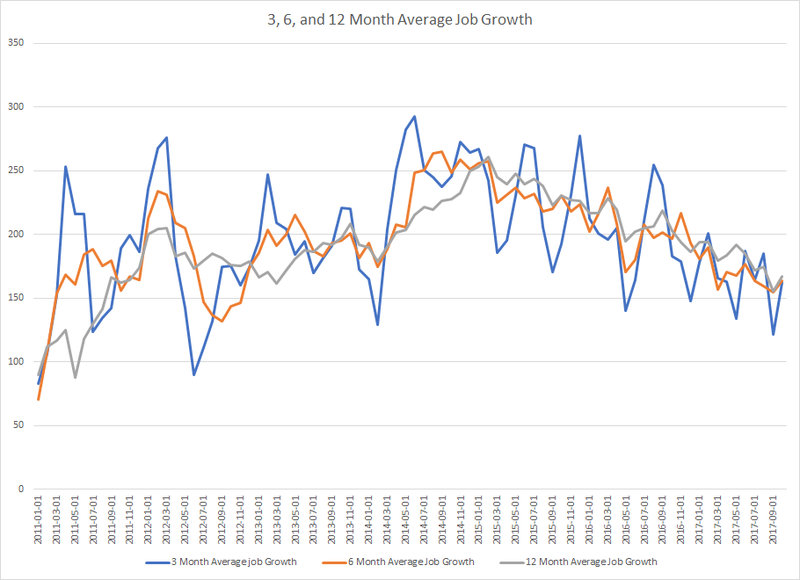 the index of aggregate payrolls rose by 0.8 from 176.5 to 177.3 .
the alternate jobs number contained in the more volatile household survey decreased by -484,000 jobs. This represents an increase of 1,959,000 jobs YoY vs. 2,004,000 in the establishment survey. Government jobs rose by 900.
the overall employment to population ratio for all ages 16 and up fell -0.2% from 60.4% to 60.2 m/m and is up +0.5% YoY. The labor force participation rate fell -0.4% m/m and is down -0.1% YoY from 63.1% to 62.7%. This was an excellent report in terms of labor utilization, decent in terms of jobs growth, and poor in terms of wages. 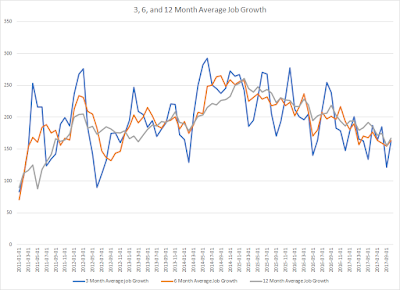 The big declines in unemployment, underemployment, involuntary part time employment, and persons who want a job now but haven't looked have nudged us very close to what has been "full employment" in the past two expansions. We may be as little as 1.5 million jobs away. The total gain in employment in the last two months is 279,000, or an average of 140,000 per month for the hurricane-affected month and the recovery. This is no better than mediocre or average. That hourly wages for nonsupervisory workers actually *fell* month over month, and are still only up 2.4% YoY quite simply is awful this late into an expansion. Bottom line: the late cycle deceleration in YoY employment gains is continuing, and outright wage deflation come the next recession looms ever larger. Here's my inflation-adjusted 2 cents. These numbers have been declining since the end of 2014. As we are now late-in-the-game of this recovery, I wouldn't expect more than 150,000 average month growth going forward. 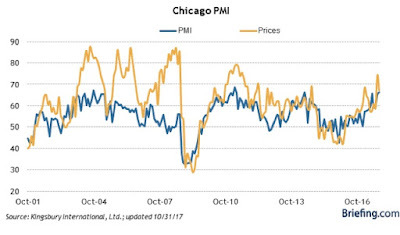 We're seeing some weak Y/Y numbers. Total service producing jobs (top chart), while still positive, are declining Y/Y. Both retail (middle chart) and information jobs (bottom chart) are declining. The top two charts were released earlier this week in the BEA's personal income data. Real DPI and real DPI less transfer payments are barely getting about 1% on the Y/Y basis. Average hourly earnings (bottom chart), which are part of the employment report, are still weak on a historical basis. Income streams are an essential component to my investment philosophy. They help to lower portfolio volatility, provide returns in a stagnant or declining market, and continually provide funds for reinvestment. 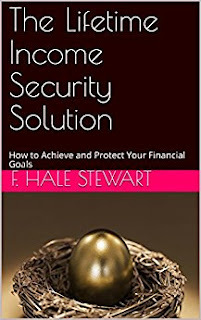 I provide more detail in my book, The Lifetime Income Security Solution. 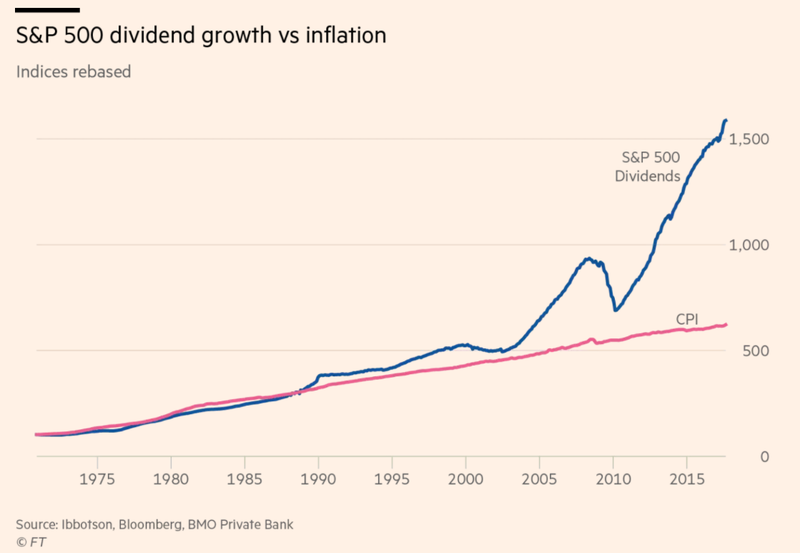 I’m also a big fan of companies that have a long history of raising their dividend, which is one of the best ways management can reward shareholders. I maintain a list of stocks that have a 25-year history of raising their dividends. When these companies approach lows on a 6 or 12 months basis, it’s time to look at adding them to a portfolio. 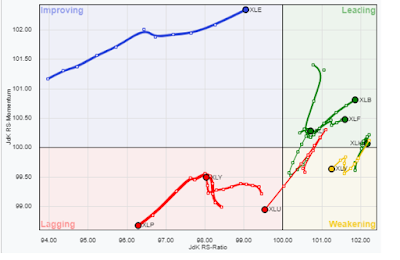 Last week, the stock gapped lower on earnings news (more on that in a minute). It looks like it’s trying to form a short-term bottom at current levels. Let’s take a look at T’s financials (as reported by Morningstar.com). Balance Sheet: their balance sheet could be a lot cleaner. Their current ratio has been below 1 for the last 5 years, which offends my inner “Graham and Dodd.” But, large companies also have the financial capabilities to maintain lower capital ratios and get away with it in the marketplace. At the same time, total equity has increased from $92.3 billion in 2012 to $123 billion at the end of last year – a nice increase for shareholders. Long-term debt has also increased substantially, climbing from $66.3 billion in 2012 to $113.6 billion in 2016. However, according to the company’s revenue statement, income expenses have dropped from 2.7% of income to 2% in 2016 – which is largely due to declining interest rates. Cash Flow: The company – like other large companies – has the ability to self-fund plant, property and equipment purchases from net income. This means that the primary “play” on their case flow statement occurs in the financial section. Here, we see a lot debt refunding over the last 5 years (which is to be expected) along with a share repurchase plan. Income Statement: this contains very positive information. First, total revenue increased from $127 billion in 2012 to $167 billion in 2016. While the cost of goods sold increased over the same period (rising from 43.3% of revenue to 46.94%), operating expenses declined from 46.47% to 38.19% and net income rose from 5.7% to 7.92%. Best of all, net income from continuing operations was up from 5.92% to 8.14% over the same time period. So – why is the stock low? Two reasons. Cord cutters: from the last earnings release: Importantly, in the domestic market, net additions of its postpaid wireless subscribers declined a massive 44.8% year over year. AT&T lost 251,000 satellite TV customers and 134,000 U-verse TV customers. However, it gained 296,000 DIRECTV NOW connections. This is an important development, but not fatal. Entertainment revenue comprises 32% of all income, according to the latest 10-Q. In addition, it appears the company is working on new products to mitigate this loss of revenue. The Time Warner Merger: AT&T and Time Warner are trying to merge. This looks eerily similar to the AOL/Time Warner deal from years ago – which was a tremendous flop. But that deal simply came too early. Time Warner has content that AT&T could bundle with its other services. While there are calls from some groups to halt the merger, or at least give it very close scrutiny, it’s difficult to see the current administration giving this deal the thumbs down. Finally, there is the dividend, which is 5.85% -- a more than healthy reward for owning this stock. The only drawback is the payout ratio is very high – 94%, indicating the company needs to grow revenue to continue raising the dividend. 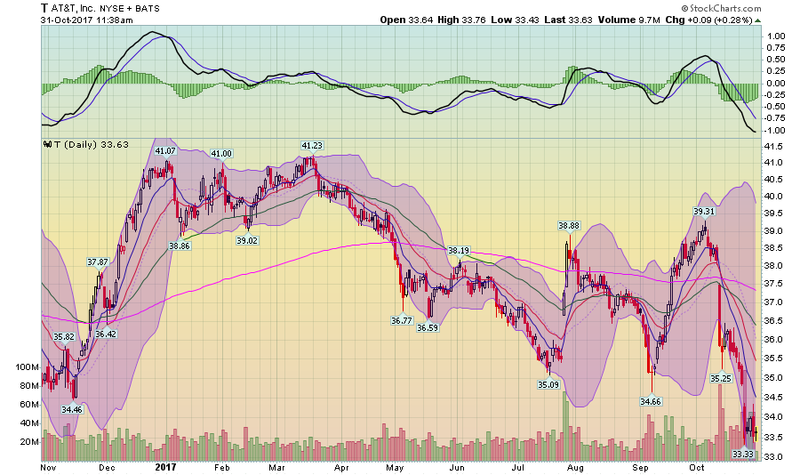 Overall, a stock with a 5.85% yield trading at a PE of 16 is worth a look when it’s near a 52-week low. 1. Personal income and spending. We've had a steep decline in the savings rate in the past year. That is something that, as the above graph shows, tends to happen in mid- to late expansion. The upshot is that consumers have less room in their budgets to absorb a future negative shock. 2. 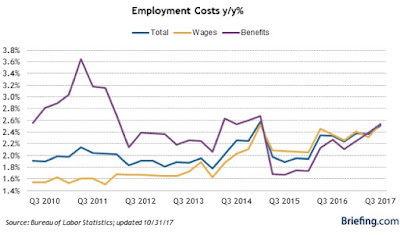 The employment cost index. YoY growth of wages, at 2.5%, is just below the expansion peak of 2.6%. At least in terms of measuring payment for the same job, there actually is some improving wage growth. Rental price pressures are accelerating! 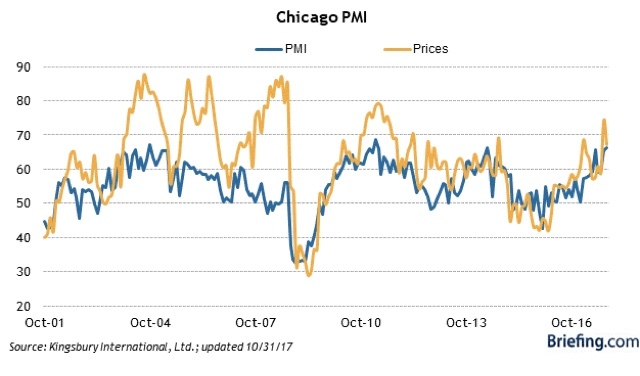 As a result, even taking into account that these have been outperforming industrial production this year, it is likely that manufacturing production when it is reported for October several weeks from now will be a positive, and most likely slightly better than last month's. These releases are all consistent with an economy that is doing extremely well right now, while laying the groundwork for the ultimate downturn in the form of additional pressures on the consumer. As I point out in my book The Lifetime Income Security Solution, dividends are a key component to investing. They lower overall volatility, steady performance and provide a constant stream of reinvestment income . The above chart partially explains why. Treasury yields started to drop in the early 1980s and have continued to plumb new lows since. While many people have correctly noted that yields have nowhere to go but up from their current position, it's doubtful we'll see a major advance with inflation so low. 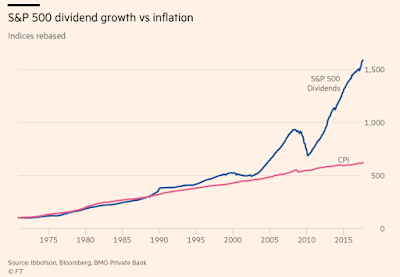 Add all this information together and you have a powerful argument for focusing on dividends. What is the real cost of shelter? Over the last decade there has been lots of discussion of housing prices in isolation. 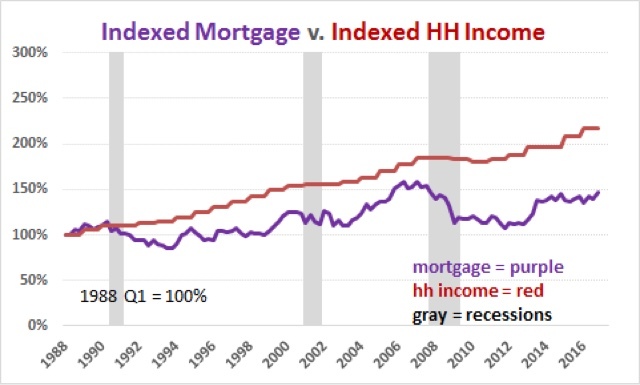 Sometimes that discussion includes an inflation adjustment -- which is problematic, since housing constitutes nearly 40% of the entire consumer price index, so in essence housing is being deflated largely by the cost of housing itself! 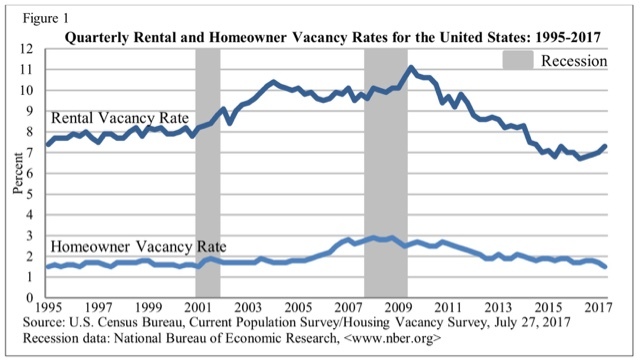 From time to time there has also been a little -- but not much -- discussion of rental prices. But I have never seen a discussion of the relationship between the relative cost of homeownership vs. renting, particularly as a function of the household budget. That is a curious void. For the choice (or ability) to live in the residence one desires isn't a matter of its cost by itself, but also the relative cost of the type of residence. What is the cost of a house compared with the cost of an apartment? How expensive are each of them compared with a household's income? If both are too expensive, maybe the choice is made to live with mom and dad as an extended family. The purpose of this post is to fill that void. Herein I compare the cost of home ownership -- in terms of the down payment, but also in terms of the monthly mortgage payment -- with the cost of renting, and further, compare each to the median household income (since by definition, the people renting the apartment or living in the house are a household!). In the above graph I've divided house prices by 10, to measure the share of annual household income needed for a 10% down payment. The graph would look exactly the same, just with different nominal values, assuming a different percentage of down payment. But if down payments are so dear, why have people chosen in increasing numbers to purchase houses? Perhaps that's because, when we compare monthly payments, and compare them with the alternatives, the picture looks entirely different. In 1988 the median rent averged $343 per month. In the second quarter of this year it was $910. In percentage terms, in 1988, the median rent for an apartment was 14.5% of median household income. That rose to slightly over 16% in the mid 1990s before falling to the series' low of 13.7% in 2000. Since then it has risen to a record 18.4% of median household income in the 2nd quarter of this year. After falling briefly, at the peak of the housing bubble in early 2006 it had reached a secondary peak just over 35% of median monthly income. Even now, with the real cost of a house at all time highs, the median monthly mortgage payment is still less than 24% of median household income. 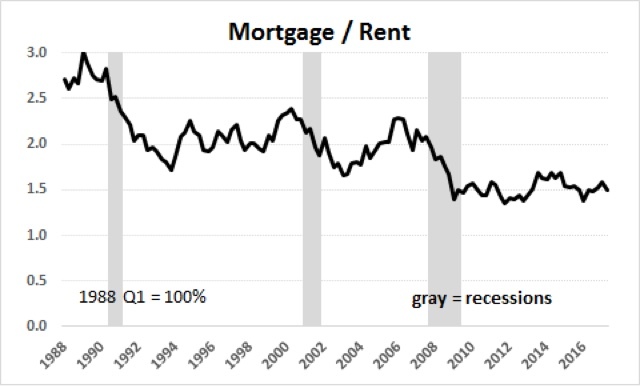 Most notably, the overall trend in the last 30 years has been that monthly mortgage payments have fallen from over 3 times median rent to about 1.5 time median rent now. Put another way, even at the peak of the housing bubble, the monthly carrying cost of a house was about 2.3 times the median cost of renting an apartment. At the bottom of the bust, that fell to 1.4 times the cost to rent. For the last five years, monthly mortgage payments have hovered near 1.5 times the median asking rent. 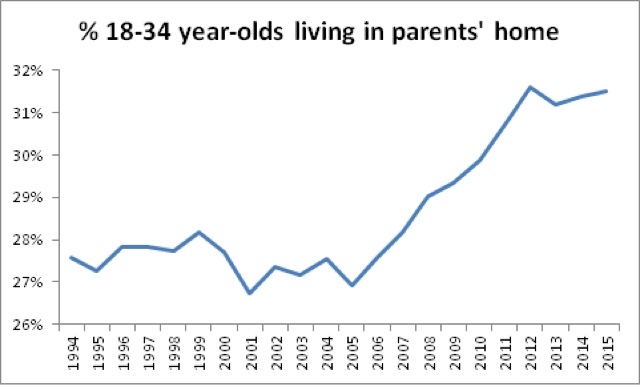 Note, by the way, that these adults are included as part of their parents' household for purposes of the homeownership rate above. Finally, that being said, it is hard for me to imagine how home sales could continue to grow much further if house prices continue to outpace even their 2005 multiple of median household income. 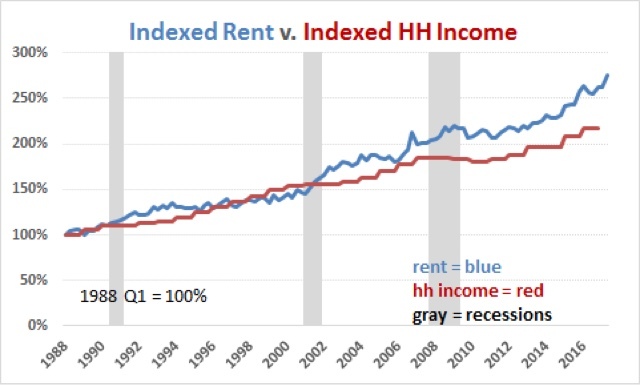 But if rental prices also continue to grow relative to median household income, then we can only expect to see even more involuntary extended family households.